Cirgraphics have designed, and manufacture their own glass to glass exposure frame. This can be fitted to all of our current production double sided exposure units, and also to some earlier machines. It is also possible to adapt the system to fit onto other manufacturers equipment. The Cirgraphics Glass-to-Glass system has been developed to meet today's exacting requirements for fine line imaging with high productivity. Being designed specifically for the Cirgraphics range of exposure units, ensures the engineering of the unit maximises the capabilities of the exposure units without any compromises. Glass to glass systems allow art work to be accurately positioned and attached to each glass surface when the registration between each can be easily checked. 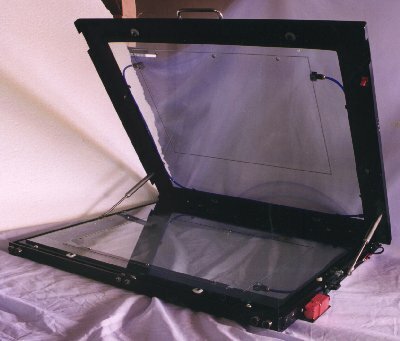 There are various methods of achiveing this, which include, having a vacuum channell machined in the upper and lower glass's to allow the phototool to be held to the glass using vacuum,using a Transfer Tape to attatch the phototool to the glass or using a UV curing glue. Panels can then be loaded and unloaded whilst leaving the photo-tools in position. This eliminates mis-registration due to wear on the photo-tool punched holes and the tendency for photo-tools to move as in some Mylar based systems, resulting in increased productivity and an improvement in quality. The unique Cirgraphics system uses a sprung loaded floating bottom glass that is accurately located between hardened and ground precision cam followers. It allows vertical movement whilst eliminating all lateral movement. This enables the hinges for the top frame to be robust, with integral thrust washers, reducing wear and ensuring that both frames remain in register. It is supported by gas struts to reduce operator fatigue. The vacuum seal is manufactured from a durable moulded rubber and is fixed to the edge of the top glass. This keeps the seal away from the work area so that it is not damaged as the panel is loaded or unloaded. The standard seal allows panel thickness from 0.1mm to 3.4mm to be accommodated. For thicker panels special seals can be provided to order. The glass is normally toughened and a variety of tooling systems can be fitted to suit most customers needs. When fitted to the T3000, T4000 and T5000 exposure units, modifications are made to the vacuum system to blow air into the vacuum frame after exposure, in order to release the vacuum more quickly and the frame to be opened sooner. Cirgraphics manufacture a variety of register pin systems to cover the majority of the processes used in printing and printed circuit board production. We have developed a unique method of attaching the pins to glass allowing precise adjustment to each individual pin so that it can be positioned to match exactly the requirements of each customer.. The range of pins includes, fixed, retractable and sprung loaded and can be round, flatted or pyramid shaped. They can be fitted to, glass to glass or glass to mylar vacuum frames and used for primary imaging and liquid photo-imageable solder masks. Many of our customers have experienced similar registration problems and have attempted to install a multitude of different solutions to overcome them, some more successful than others. Cirgraphics with their wide experience of tooling systems can usually find a satisfactory solution at a reasonable cost.